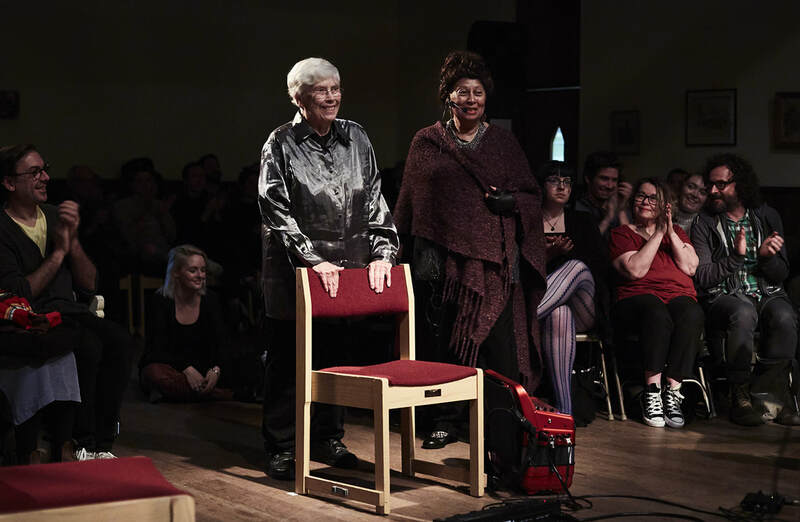 ​"Endearingly Ideosyncratic..." "..A labor of love..."
"A well-deserved standing ovation for Pauline Oliveros and Carole Ione at the world premiere of their work, The Nubian Word for Flowers: A Phantom Opera in Brooklyn last night. This was a truly masterful work, and so moving. To have the ancestors rise and reassure that “we will survive this,” and to revive a colonizer to have him answer for his crimes to the librettist was just brilliant. Wow. Beautiful script by IONE, divine music by Pauline, and sound design by the amazing Senem Pirler (among many other collaborations). Filled with amor. " ​The main focus of attention for listeners of “Four Meditations” will likely be the voice of Ione, Oliveros’ long-time collaborator. Though her fellow musicians all make vital contributions, Ione’s vocals are like a bright star around which all other sounds orbit. She’s adept at glossolalia-like stretches of abstract sound, improvising in the same league as expert voice experimenters such as Yoko Ono and C. Spencer Yeh. But her use of literal language is just as important. At one point Ione slowly intones “I am who I am,” then flips that into “I am who you are,” seeming to comment on music that inverts definitions and blurs boundaries. Ione is a noted author, playwright/director and poet whose works include the critically acclaimed memoir, Pride of Family Four Generations of American Women of Color, Listening in Dreams and This is a Dream! Other works include; The Night Train to Aswan and Nile Night: Remembered Texts from the Deep and Spell Breaking; Remembered Ways of Being, and Anthology of Women’s Mysteries. She is the playwright and director of Njinga the Queen King (BAM’s Next Wave Festival )and the dance Opera Io and Her and the Trouble with Him ( Union Theatre, Madison,WI) The Lunar Opera; Deep Listening For_Tunes. 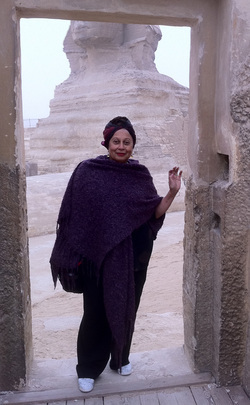 (Lincoln Center Out of Doors), She has created two experimental films, Venezia e L’egitto and Dreams of the Jungfrau. Ione and Pauline Oliveros are currently collaborating on The Nubian Word for Flowers, A Phantom Opera. Encompassing the Nubian Diaspora and the life of Lord Horatio Herbert Kitchener of Khartoum, the opera is "a deep dream exploration of Nubian soul and the Colonial Mind". Ione is also an improvising sound/text artist who performs in the United States and Internationally. Ione is the Founding Director of the Ministry of Maåt, Inc ( MoM, Inc) and Former Artistic Director of Deep Listening Institute, Ltd. Both organizations seek to foster a harmonious world community. She is a Deep Listening Certification Instructor, Center for Deep Listening, Rensselaer, Troy, NY. INTERVIEW WITH IONE One month out from the November 30 premiere of Nubian Word for Flowers at Roulette with International Contemporary Ensemble, our Artistic Director Jason Cady sat down with writer/director Ione to discuss the opera and her work with composer Pauline Oliveros. Read the full text to learn more. Check out our Trailer for Nubian Word for Flowers for a sneak peak at the performers from their September workshop performance at Mt. Tremper Arts.